Coyotes can be traced back almost 2 million years to the Pleistocene era, where they lived in the Americas at the time of the dire wolf, the predecessor of the smaller and faster old world-originated gray wolf, canis lupus. 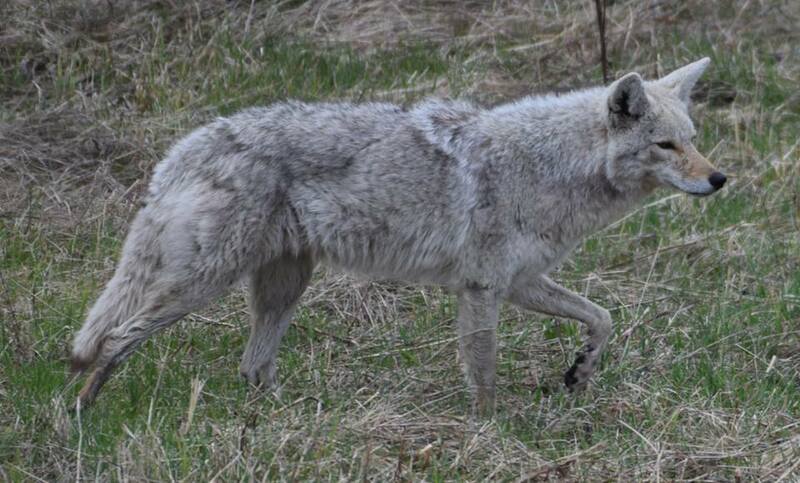 Eastern Coyotes began appearing in New York State in the 1930s, over time occupying, with respect to smaller game, the predatory role of the exterminated eastern wolf. Eastern coyotes are significantly larger than western coyotes, with weight ranges of 35 to 45 lbs. for adults, and up to 60 lbs. for large males. In fact, contrary to the rule that correlates larger wolf size with more northerly latitude, there appears to be a more important longitudinal size difference between western coyotes and eastern coyotes: the farther east one looks, the larger the coyotes, such that a female eastern coyote is considerably larger than a western male. DNA studies seem to indicate that despite the fact that keystone predators like gray wolves typically kill mesopredators like western coyotes, some cross breeding between eastern wolves (canis lupus lycaon, such as those wolves encountered in Algonquin Park), and western coyotes may have occurred on the Ontario side of the Great Lakes Region, producing a larger, hybridized "Tweed" canid that gradually began to predominate, pressing eastward, across Ontario, Quebec and New England. DNA studies of eastern coyotes in New England, suggest a DNA combination of 60% western coyote, 30% Algonquin wolf (Eastern wolf) and 10% dog. 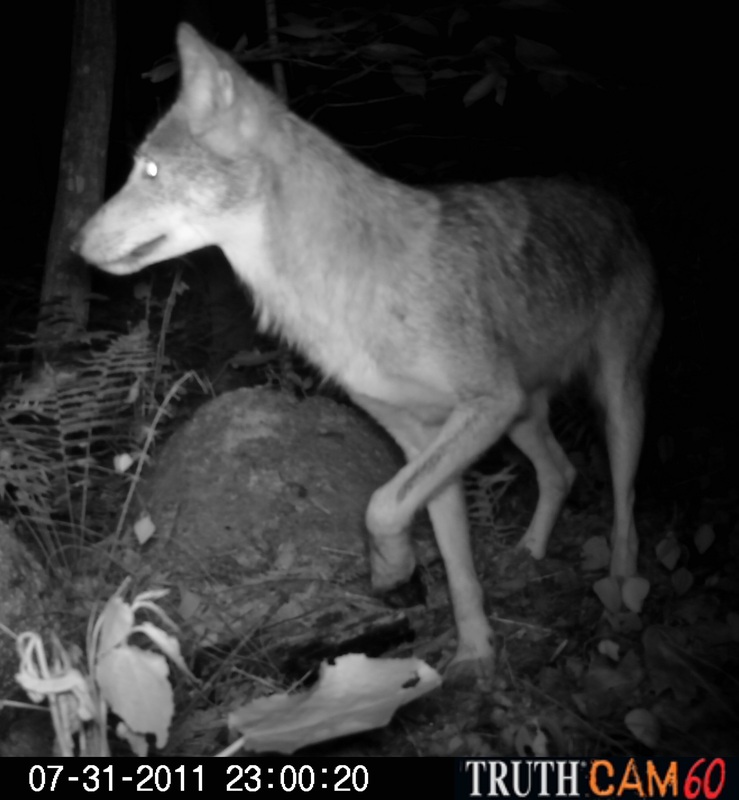 To further muddy the issue, the red wolf of the southeast may be more closely related to the eastern or Algonquin wolf, than is the gray wolf of the west and Minnesota-Wisconsin-Michigan region. In addition, the colorful variety of popular names designating the eastern coyote, for example, brush wolf, coydog, adirondack wolf, etc. make it appear that we are discussing more than one animal. 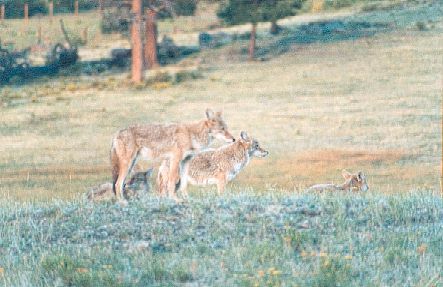 Eastern coyotes clearly require a better public relations team, as it seems that their larger size neutralizes the cuteness factor of the western coyotes and Wiley Coyote, while increasing the fear factor of their larger gray wolf cousins, however unwarranted those fears may be. In either case, eastern coyotes probably have as much right to the word “wolf” in their names, as they do “coyote”. 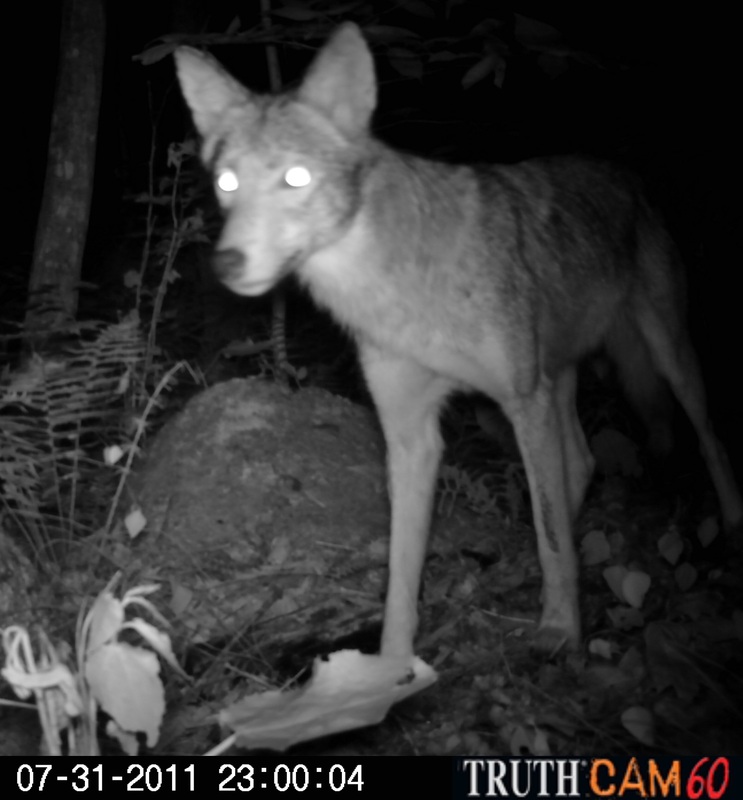 Our friend, Jon Way, who did his PHD on the eastern coyote, and who provided much of the information contained here (his web page is at http://www.easterncoyoteresearch.com/index.html), calls them “coywolves”, which better captures the reality of their heritage. The average male wolf is about 90 lbs., with natural selection rewarding slightly larger mass, the further north they occur, and the colder the climate. In addition, wolves have longer legs than coyotes, as well as broader feet and a more massive head, with less pointed ears and a more prominent muzzle. Still, most wildlife sightings are sudden, unexpected and brief, so it’s easy to see how folks could exaggerate in their minds the size of a fleeing coyote, and conclude that they have seen a wolf. I once had a friend describe another acquaintance’s malamute, spotted while it was streaking through her yard, as being significantly larger than our wolf hybrid, Cree, while I knew for a fact that Cree was ten pounds heavier. In addition, wolves and coyotes both look much thinner and rangier in Summer than they do in Winter, due to the shedding of the Winter coat, so time of year can give a very different impression of size, even in the same animal. 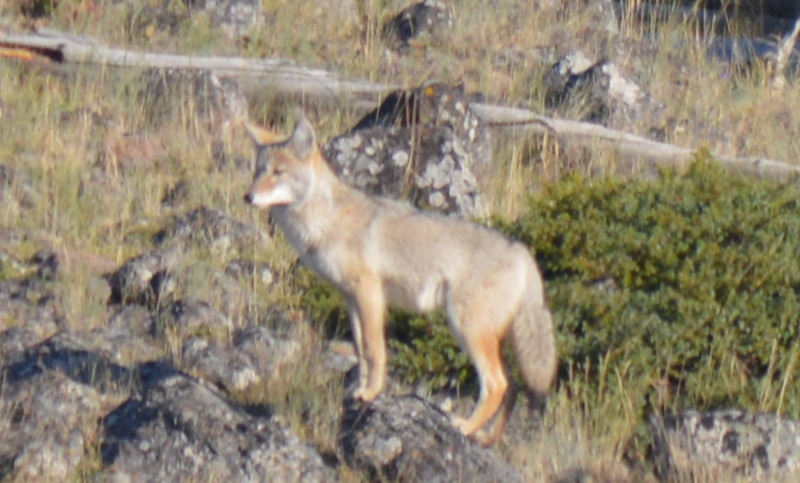 Coyotes have a generally grizzled appearance, with blackish, brownish, reddish and tawny patches, and a creamy to whitish throat and chest area. 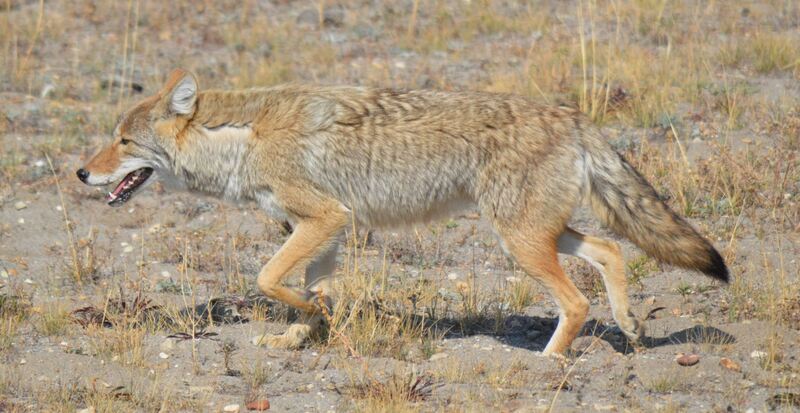 Coyotes run with their puffy tails held straight, and angling straight out or downward. Unlike wolves, coyotes are excellent climbers, scrambling and propelling themselves up and over chain link fences, a thought to consider when fencing in and protecting pets, and which explains why Dakota’s enclosure has a top. Coyotes are more family oriented than red fox, who generally stay together only during mating season and raising the pups, but less so than gray wolves, with coyotes being more apt to go out on their own during the difficult Winter months, when much of the prey they hunt in Summer are hibernating. Like wolves, coyotes mate in February, with litters of 4 to 10 born about 2 months later. 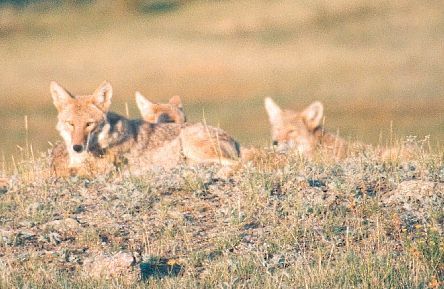 In a process not well understood, litter sizes tend to increase during periods when coyote numbers are low, thus frustrating efforts to control coyote numbers. 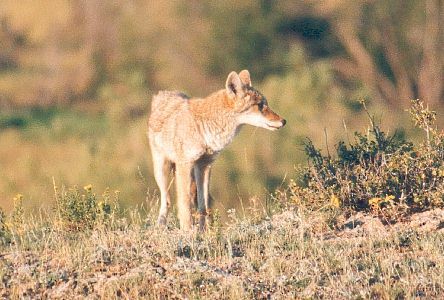 Coyotes defend territories of about ten square miles, much smaller than wolf pack territories, and it’s not unusual for coyotes to travel from 10 to 15 miles per day. Upon reaching sexual maturity, pups often disperse from the pack, and may end up 100 miles from where they were born, in their quest to set up their own territory and hook up with a mate with whom they may have a monogamous relationship for a period of years. Coyotes live only about four years in the wild. 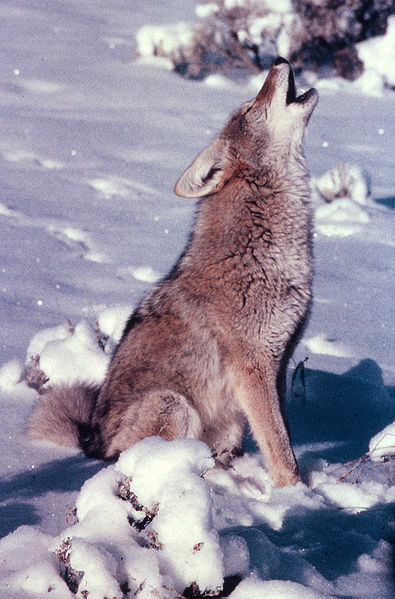 Coyotes prey on small mammals, such as hares, woodchuck, beaver and rodents, and the occasional household pet. Insects and fruit are all also consumed. Deer, particularly fawns, are an important part of the coyote diet, and while hunters complain that marauding coyote packs impact the 80,000 white tail deer in the Adirondack Park, I suspect that lack of hunting skills plays a more important role. 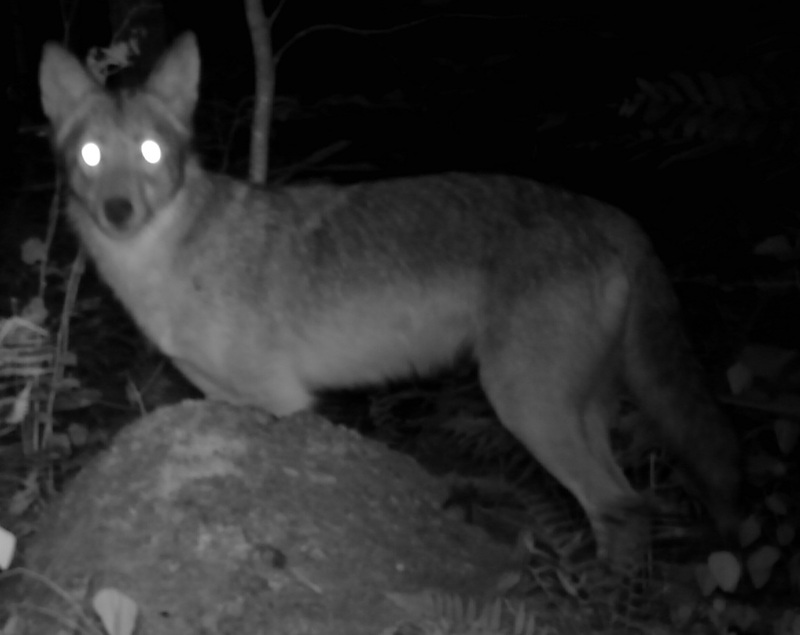 Here in the Adirondacks, many folks blame the coyotes whenever a cat goes missing, but while there is no doubt that cats caught out in the open will be taken by coyotes, we believe the cats’ more serious adversary, at least in wooded areas, are the fisher, and the Great Horned Owl, which swoops down from behind, attacking the unwary cat with those powerful talons. Many other predators and scavengers are helped by coyote predation, including eagles, martens, fishers, fox, turkey vulture and raven. Coyotes are by nature omnivorous and opportunistic, and thrive in suburban settings, so keep the garbage cans secured, the pet food bowl inside, and the compost heap far from the house. Coyotes will also stake out bird feeders, which attract squirrels. 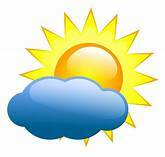 The rule of thumb for protecting small pets is to always accompany them outside. While coyotes are afraid of people, your smaller pets represent an opportunity for a starving predator, particularly in Winter. For those coyotes who have acclimated themselves to seeing people up close, making loud noises while approaching them, will generally drive them off. Coyotes do on very rare occasions attack people, or more likely, pets which are being walked by people. 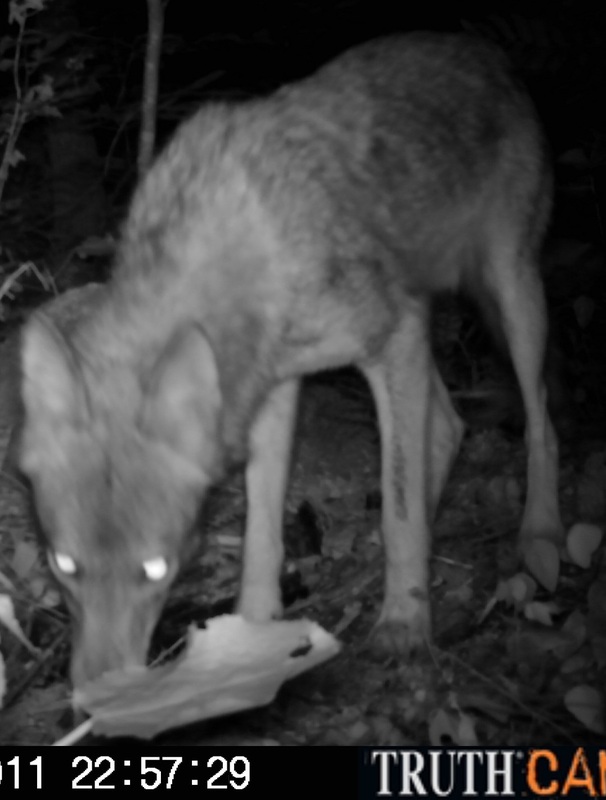 Coyotes who come to associate food with people may gradually lose their fear of people, and become more bold in their attempts to capitalize on the virtual smorgasbord of potential food sources we routinely present to wildlife. However, never forget the George Carlin theory of media, which basically says that the only time we read about a bear, is when a bear bites someone, and as a consequence, our fears are driven more by frightening anecdote than actual data. 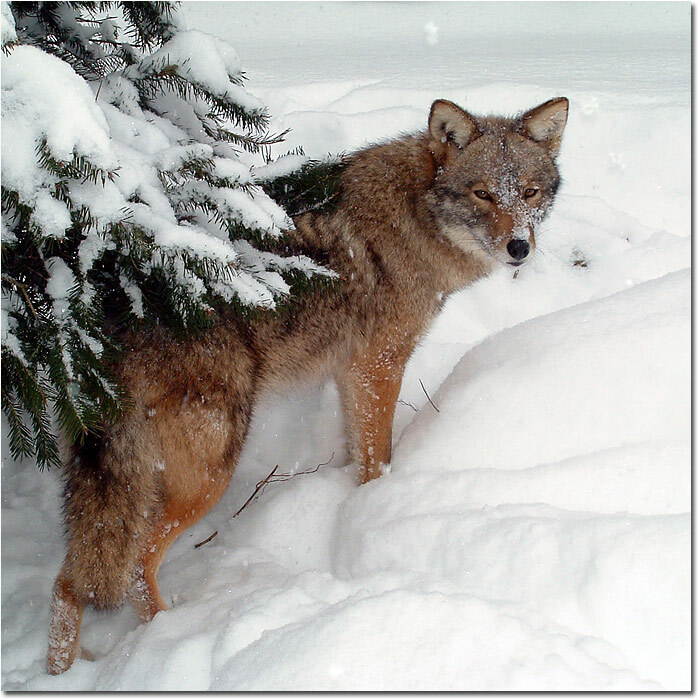 Domestic dogs and coyotes each kill annually many more sheep and cattle in Montana than do wolves, yet there is no demand that we euthanize dogs, and coyotes, lacking the wolf’s size, power and mystique, never rise above the judgement of “pest” in the rancher’s eyes. Our exhibit coyote, Dakota, is from Illinois, and we suspect he is more likely of western coyote descent. Dakota became imprinted on a well-meaning person, who tried to raise him, until he realized that Dakota was not a dog, and had reached such a level of dependency that he would not survive in the wild. Dakota is a poster child for why it is better to let nature provide the education and experience for growing critters. 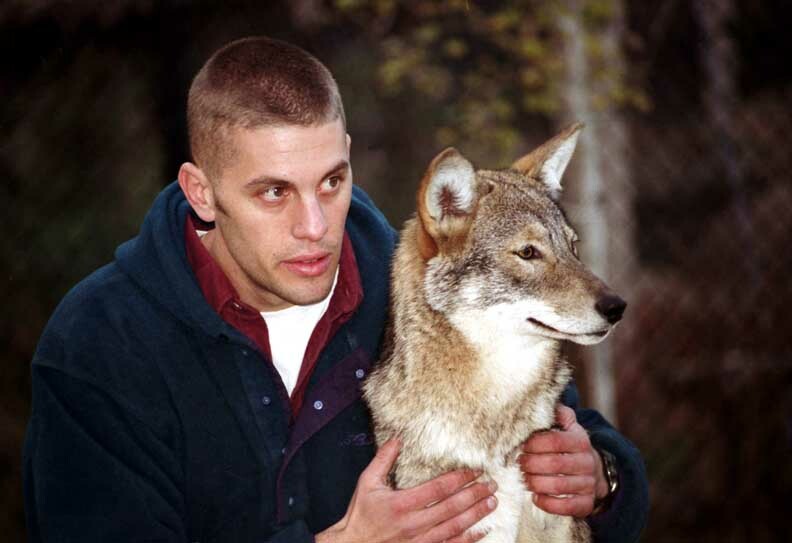 Jon Way, founder of Eastern Coyote Research with one of his subjects. Dakota, by Jonas Borkholder, above, and Steve, Dakota is a western coyote. 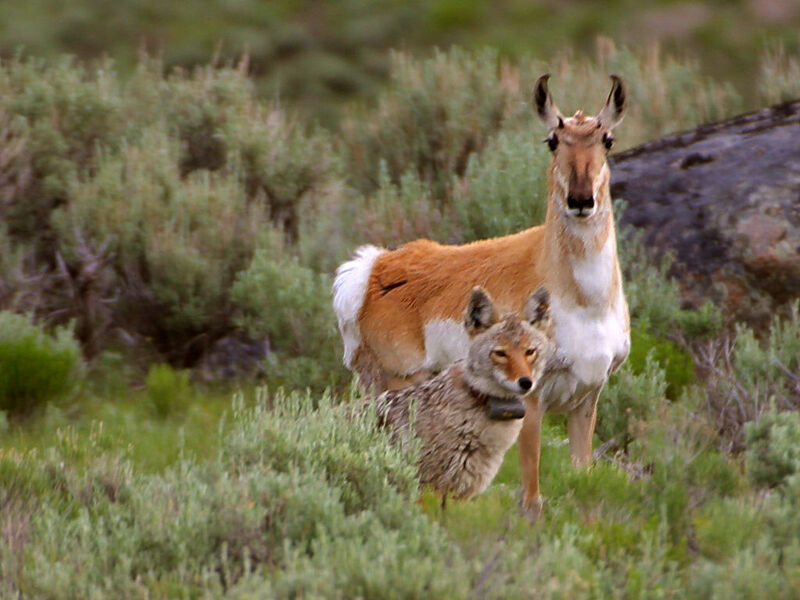 A radio collared coyote with a Pronghorn, and a coyote howling. Interesting books (click on link to order), and great links for learning more about coyotes.